Throughout this theme, have children return to your circle time area at specific times during the day. For example, you may choose to meet in your circle time area first thing in the morning, right before lunch to discuss your morning activities, and following the afternoon snack to review everything children learned during the day. Circle time is an important part of your daycare routine. This week, we have prepared a motivational chart you can complete at the end of each day with the children in your group. (Open motivational chart) Print, laminate, and display. Let children decide whether their behaviour was appropriate or not. 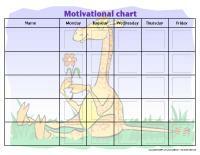 The goal of the motivational chart is not to reprimand little ones, it should motivate them to do their best! 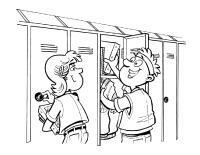 Ask eacs near your entrance. Parents will enjoy trying to guess who each baby is too! (Open task train) Print, laminate, and cut out. Display the train in your circle time area. Tasks may be distributed several different ways. You can, for example, place the cards with the children's names or pictures face down on the floor and pick one card at a time. When a child's card is picked, he may choose the task he would like to be responsible for. You may also place the task cards face down on the floor and pick them one at a time. Invite children to raise their hand if they would like to be responsible for the task. If you prefer, you may play a game of musical ball. When the music stops, the child holding the ball may choose his task among those available. Add new responsibilities as the year progresses to provide new challenges. Blocks of all kinds which can be used to build various structures... from the smallest to the tallest! Cardboard boxes can be used for building gigantic structures. Simply wrap them with colourful duct tape and they will be practically indestructible. Several different rulers children can use to measure and draw straight lines. Ask parents to provide a picture of their child as a baby and ask children to use the pictures to draw themselves when they were smaller. Display. Ask children to draw what they want to be when they grow up. As a collective project, make your own growth chart. Draw the basic model and let children decorate it as they wish. You may also invite each child to create his own symbol which can be used to indicate his current height. Reproduce the story of Goldilocks and the three bears. You will need three different sizes of chairs and teddy bears along with a few accessories and a lot of imagination. Add several dolls to your area so children can pretend to care for babies of their own. Grown-up accessories such as shoes, jewellery, clothing items, etc. Children will love to dress up and pretend they are adults. A shoe with laces...children can practice tying shoelaces. A shirt with buttons and a coat with a zipper. Dolls which can be stacked one inside the other or sorted from smallest to biggest. Board games (memory game, lotto, etc.) involving animal families or people. Offer modeling dough with different sizes of cookie cutters. Encourage children to make balls or snakes and compare the sizes. Sequential stories children must place in the correct order... great for the concept of evolution. Rattles and other baby toys children played with when they were babies. Arrange pictures of the children who attend your daycare in an album. If possible, select pictures which show how much they have grown. Create an original obstacle course which involves the concepts of small, big, over, under, behind, in front, etc. A trampoline. Children can jump on it and pretend they are very tall! Stilts (you can make your own using metal cans and rope). Use different sizes of containers. Provide different sizes of figurines. At the Dollar store, purchase animals which grow when they are plunged in water. You may also purchase tiny sponge capsules which "appear" in water. The pictures may be used as a memory game or to spark a conversation with your group. Use them to decorate the daycare or a specific thematic corner. (Open picture game-I am growing) Print, laminate, and store in a Ziploc bag or in your thematic bins. The flashcards may be used to spark a conversation with your group, in your reading and writing area, or to identify your thematic bins. 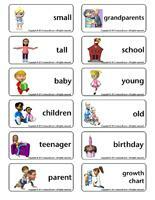 (Open word flashcards-I am growing) Print, laminate, and store in a Ziploc bag or in your thematic bins. Hold a magic wand in your hands. When you touch a child with your wand he becomes a baby, a child, a parent, or a grandparent. The child you transformed must act out the role you gave him. Arrange clothing items in a large pile at one end of the daycare. Children must run to the pile, select an item and slip it on before running back to the start line. If clothing items have buttons or zippers, encourage children to do the best they can. This is an excellent game to help children practice getting dressed. Choose one child to be the game leader. He acts out various adult actions and the others must repeat his every move. Deposit a variety of objects on the table: feathers, pasta, buttons, pieces of paper, blocks, etc. Ask children to sort the objects from smallest to biggest or from biggest to smallest. Sit in a circle with your group. Ask children to remove one of their shoes. Next, encourage children to compare their shoe size with their friends' shoe size. Identify the smallest shoes and the biggest shoes. Provide old shoes children can use to practice tying their shoelaces. We have prepared a poster which shows the various steps. 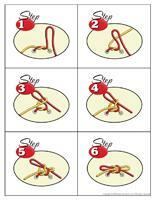 (Open poster-I can tie my shoelaces) Print, laminate, and display. Plant seeds and watch them grow. Make sure children notice that not all plants evolve at the same speed, just like we don't all grow at the same rate. Provide a kitchen scale. Let children weigh a variety of objects found in the daycare. You may also select specific items prior to the activity. Children must identify which item is the heaviest/lightest. Also provide measuring cups, a container filled with water, and a variety of empty containers (different sizes). Children use the measuring cups to pour the liquid in the containers...the same quantity of water can appear to be less when poured into a different container. Make different sizes of gingerbread men with your group. In a bowl, beat butter and sugar until smooth. Incorporate the egg and the molasses. Combine dry ingredients and add them to the creamy mixture. Mix well. Wrap cookie dough in plastic wrap and refrigerate for at least 2 hours. On a floured surface, roll dough out to approximately ¼ inch thickness. Use cookie cutters to create gingerbread men. Place the gingerbread cookies on a lightly greased cookie sheet. Bake in a 350⁰F oven for 12 to 15 minutes or until cookies are firm and golden. Cool on wire racks. Children will enjoy decorating their cookies. Purchase one package of Pillsbury gingerbread mix. Prepare according to instructions on package. (Open game-I am learning how to cut) Print and staple a booklet together for each child. 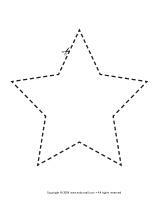 Throughout the theme, encourage children to practice tracing and cutting the shapes. Have each child lie down on a large sheet of paper. Trace the outline of each child's body. Provide a variety of materials such as felt, tissue paper, paint, crayons, glue, glitter, yarn, etc. Children dress and decorate their body outline as they wish. When they are done, cut all the characters out and arrange them on a wall so it looks like they are holding hands. You may arrange them so they are in order, from smallest to tallest. Every month, have children draw a picture on a paper plate. Assemble each child's drawings together to create a mobile. Children will love to see their mobile grow each month! (Open diploma-I am growing) Print for each child. Let children color their diploma, adding a picture/drawing of a recent accomplishment. When they are done, you may laminate the diplomas. (Open activity sheets-I am growing) Print for each child. Children must cut out the pictures and arrange them in the correct order: baby, child, adult, elderly person. (Open coloring pages theme-I am growing) Print for each child.